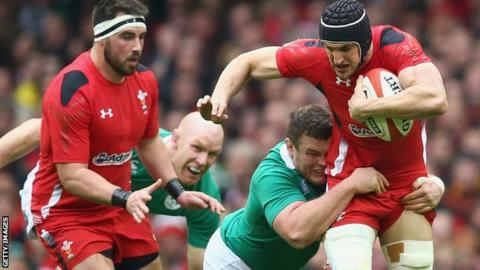 Captain Sam Warburton says Wales must learn from their 26-3 loss in Ireland in the 2014 Six Nations and try to silence the Dublin crowd on Sunday. Wales have beaten Ireland twice since that contest, but it had an impact on the 2013 British and Irish Lions skipper. "It wasn't a good experience, it will put us on edge," he said. "I remember seeing Ireland get their tails up as the crowd started getting behind them." Warburton added: "So [we'll be] trying to stick a pin in that balloon early on." Wales were reigning Six Nations champions when Schmidt's side comprehensively outplayed them in February 2014. It was the first meeting between rival coaches Schmidt and Warren Gatland in an international. This weekend's match sees Ireland start their bid for an unprecedented third consecutive title, but with a team shorn of eight high-profile players because of injury. But Warburton does not expect anything other than a tough battle from the hosts, who he says are the most physical of the Six Nations teams to play against. "We've just got to make a really good start I think," he said. "I remember the first 15-20 minutes [in 2014] defending a few phases and the Irish crowd were very loud and you could see the Irish team feeding off that and they just kept growing through that game. "To try and stop that kind of thing early on is pretty important. "Since I've been involved Ireland have always been one of the toughest Six Nations games. "Last year was probably the most physical Six Nations game I've ever played in, and it's the same year on year with Ireland." Wales have won Grand Slams in the years after the last two World Cups, and Warburton says the players want a hat-trick. Wales bounced back from their disastrous 2007 tournament to take the Six Nations crown in Gatland's first season in charge, but it was less of a surprise when they followed up their excellent 2011 World Cup campaign with a second clean sweep under the New Zealander. "The Welsh fans - they're well aware of the fact that we won Grand Slams after World Cups and I know that's what they are fully expecting this year as well," added Warburton. "But that's what the players would set as a target anyway. "Every championship we come into we want to win it now. We were very disappointed we came third last season even given the circumstances - we were desperate to win that so we'll hopefully put that right this year."